How long do you cook lamb? Here’s a handy chart. How Long Do You Cook Lamb? 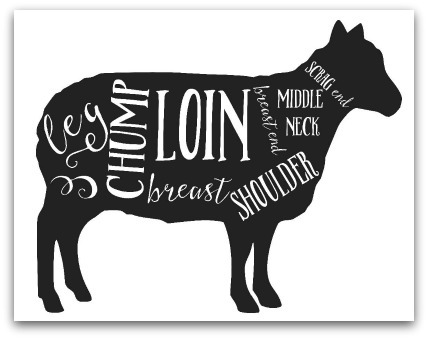 How long do you cook lamb… that’s a common question and I think the times and cuts listed below will serve you well for all your lamb cooking needs. My one piece of advice is that you do not over cook lamb. It's best, in my opinion, served medium rare. The following are roasting times for the most popular cuts of lamb. And here you can find the best methods for cooking lamb. A meat thermometer will register 145°F for rare, 160°F for medium and 170°F for well-done. Roasts should stand tented under aluminum foil for 15 minutes before carving and serving. During this standing time the temperature will continue to rise 5 to 10 degrees. So if you want your roast done to medium, take it out when the thermometer reads 150°F and allow the temperature to rise. Here's a great article about kitchen thermometers. And while you're here, why not have a look at how you can use up leftover lamb. I'm always adding new recipes to the site so visit often! I love inventing new recipes or tweaking old ones so they suit my low carb lifestyle! Fun in the kitchen all the time. Let's go HOME from How Long Do You Cook Lamb.